The Internet has changed the way homebuyers search for homes. The problem is the real estate industry has not changed. Most new homebuyers begin their search for a new home on the Internet instead of contacting a real estate agent. Since homebuyers do part of the work, we believe you should share in the commission! Here’s how it works, homes listed on the MLS typically offer a cooperating commission of 2.5% of the purchase price to the agent that brings a buyer. When you use one of our agents to represent you in the purchase of any Illinois home listed on the MLS, we collect the cooperating commission being offered and share a portion of that commission with you. You receive that share as a rebate…it’s that simple. Use the rebate to pay closing costs, to purchase furniture or any way you see fit. The rebate amount can be as high as 1% of the purchase price but may vary depending on the sales price and your specifics needs, please call one of our representatives for more details. Please note – we cannot represent you if you already viewed a property with the Listing Broker or if you have signed an Exclusive Buyer’s Agreement with another broker. In order for you to receive the rebate, you must contact us first, it must be clear that Prello Realty, Inc. is representing you in the transaction. Call us at 773-472-8900 or simply fill out the form to get started. Is this rebate program related to a government stimulus program? No. The rebate we offer is completely separate and comes directly from us. Who actually pays the commission? The seller will pay a commission to their listing agent at closing. As your agent, we receive a portion of that commission from the listing agent, we then share our portion of the commission with you. Will using a “buyer’s agent” and receiving a “rebate” affect the price I pay for the property? Absolutely not. The seller and listing agent agree on a commission percentage prior to the home being listed in the MLS for sale. The agreed upon commission percentage is deducted from the final sales price and paid to the listing agent at closing. If the buyer doesn’t have their own agent, the listing agent will simply keep the entire commission amount. Wouldn’t my interests be better served by contacting the listing agent directly? No. If you contact the listing agent directly that agent also becomes your agent. 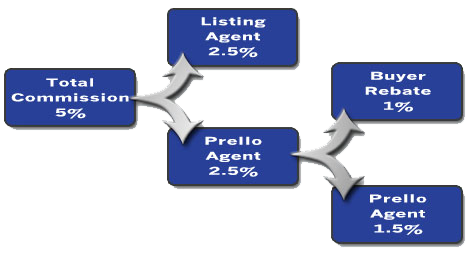 This is called dual agency, in cases of dual agency, the listing agent represents both the seller and the buyer. Your interests would be better served if you had your own agent representing you in the transaction. Having an agent represent you doesn’t cost you anything, it doesn’t effect the commission being paid by the seller or the final sale price of the property. It just effects how the total commission will be distributed at closing. How available will my “buyers agent” be to answer questions and show me homes? We have experienced full time agents available at all times, they will make themselves available to you anytime you have a question or want to view a property. You’ll be assigned a specific agent and given their cell phone number and direct email address. You will receive your rebate in one of two ways, either by check (approximately 7 days after closing) or the rebate amount can be applied directly to your closing costs? Will I be taxed on the rebate amount? It depends, you should consult your attorney and/or your accountant for income tax implications.